Click below to go directly to item. "Kendall Optometry Ministry, Inc" is a non-profit 501-(3)(C) organization. All purchases that you make below are tax deductible. All profits from these purchases go to continue to fullfill the mission of the organization as stated here. Shipping (for continental U.S. only) will be added (if necessary) at checkout. E-Mail hollandkendall@kendalloptoministry.org if you must ship elsewhere. Our credit card purchase support company has gone out of business. We still list our products below and if you want to purchase any of them, just send us an E-Mail by clicking this link. Include in your E-Mail your full shipping information, phone number and the list of products you wish to purchase and we will send you and estimate which includes accurate shipping costs. If the estimate is satisfactory, we will turn it into an invoice so you can mail in a check. We will then ship the product. We hope we will be able to handle credit card purchases soon. Computer programs produced by Kendall Optometry Ministry, Inc.
Prices include 1 year of free updates and support. Updates are downloaded from web site or may be E-Mailed upon request. Program used in the mission field to keep track of your used prescription inventory and provide guidance as to their selection. Includes built in video instructions. Makes selection process straight forward and easy. Click Eyeglasses-Inventory to read about the eyeglasses inventory program. Program used to collect glasses prescription from several models of lensmeters. Also, provides manual or barcode entry of glasses prescription data. Creates file format compatible with Eyeglasses Inventory Program above. Click Reader Program to read about the Glasses Reader program. Shipped in a dual CD holder. The cost is for each PC which runs the software. Purchase multiple copies for multiple PCs. All manuals below are in black and white. The (Color) part numbers are in parenthesis below. Tab 5: KOM Field Assembly Glasses Kit Instructions. Tab 6: Eyeglasses Rack Assembly Instructions. 1) KOM Optical System Assembly Steps. 3) Retinomax 3 Cable Connection. 5) Retinomax 3 Lineup in the case. 1) Adding extra space to the eyeglasses inventory duffle bag. 2) Bulls Eye doubled in 4 pages. 4) Progressive Identification grid in 4 pages. Also includes copy of both the Glasses Inventory and Reader programs plus a training DVD on the use of the Retinomax 3 autorefractor. This is the Righton Retinomax 2 training DVD to show you how to use the instrument properly in concert with the Eyeglasses Inventory Program. This DVD shows how to use the Reichert AL200 Lensmeter in concert with the Glasses Reader Program. NOTICE: The Reichert AL200 Lensmeter can be purchased at a reduced cost directly from KOM by clicking this E-Mail link and indicating your request for a quote. This box is a crucial part of a smooth running optical mission. Used in conjunction with the Eyeglasses Inventory Program, one can quickly and easily find the right pair of glasses for the patient. The double wall construction is indicated when the outside box will be used over and over again to ship the glasses to different villages. The single wall construction is indicated when the outside box will be used 1 to 3 times to ship the glasses to different villages. Each box hold two trays of 80 pairs of glasses for 160 pairs per box. Click here to see details about the box. For a single invoice, rather than ordering here, click on the following link and E-Mail your order: Sales Department There will be a $3 discount for E-Mail orders. It is sometimes important that the eyeglasses storage box shown above be carried on international flights. Due to airport security requirements, these storage boxes might be inspected. It is also important for them to be protected against moisture and physical damage. 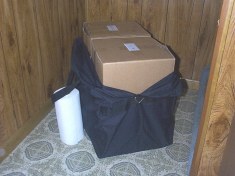 Using the Storage Box Travel Bag, the boxes may be safely shipped without having to tape them down. 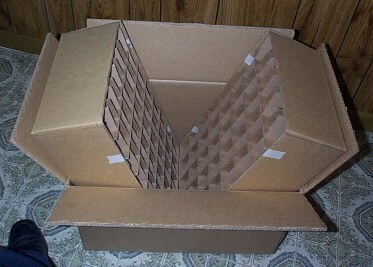 This would avoid damage by inspectors who may cut the box to get it open for inspection. 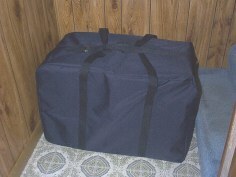 Above is a picture of the Storage Box Travel Bag. To the right above is shown the boxes being removed. For a single invoice, rather than ordering here, click on the following link and E-Mail your order: Sales Department There will be a $2 discount for E-Mail orders. Below are listed cables which are specially designed by Kendall Optometry Ministry. Shipping added to each item. Other cables can be provided upon request. (2) = Use with Glasses Inventory Program.